Can you imagine what it must have been like for Langston Hughes to wait tables at a restaurant full of people who didn’t know that he was one of the greatest poets ever born? Can you see him humming the weary blues while he doses off on a New York City subway nearly missing his stop? I wonder if he ever seriously considered giving up. Perhaps he even doubted whether or not the written page is the best place to put African rhythm. There were probably days when he thought about joining a band like everyone else. Hard times for a black scribe. 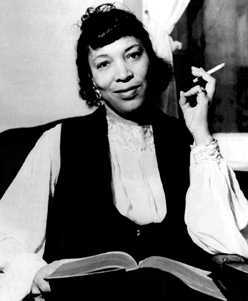 I can’t picture Zora Neale Hurston cleaning up some white ladies kitchen after she wrote down some of the most outstanding stories ever told. After she perfected the craft of creating imagery with words, after she captured black vernacular in a way that no one has either before or since, after she immortalized her little colored town. What must it have been like to be unappreciated by nearly all of her black contemporaries? How must it have felt to have to walk through the back screen door of a white families house and clean their kitchen in the hot Florida sun? Perhaps she felt like her gifts to literature had never been accepted. Perhaps she died not knowing that she was supernatural. They say that Ralph Ellison became unraveled when a young writer dismissed him by calling him an Uncle Tom to his face. The same people said they saw Richard Wright shedding many a tear when James Baldwin proclaimed that “Native Son” was one-dimensional. But they don’t tell me whether or not they instigated. I’m sure that they did. There must be something a little off about a person who decides to write a letter to entertain a man who is accustomed to having fantastical tales whispered into his ear. Abiyoyo and Anansi and the spider were just as rich before they were printed and published, but now the western tradition of book worshipping has been infused with soul. Open up a black book and you can see a nappy head and taste candied yams. It’s tragic that the great prophets of the written page struggled so mightily but what they left is divine. I’m so grateful that none of them quit before their voices were read.